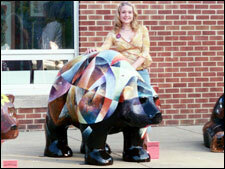 “Bear Odyssey” is what Mike Hale named the Epps Advertising bear. 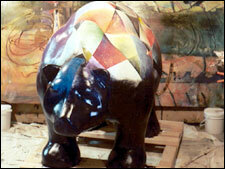 He explained that the bear’s design was inspired by the move 2001: A Space Odyssey, and one can certainly find images reminiscent of the Milky Way all over his bear. Look closely to find horizons, sunbursts, sunsets, sunrises, comets, shapes of planets. 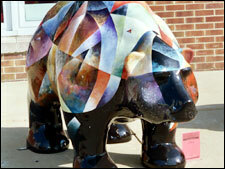 Look for the color palette of galactic skies, the repetition of geometric shapes—circles and triangles—in every inch of the bear. 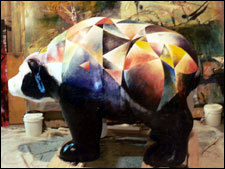 “Bear Odyssey” takes you places out of this world. Hale creates these textured pieces in his studio, wearing paint-splattered jogging shorts and periodically sipping a cup of tea. His concentration is broken only for an afternoon jog. Last year, he struggled with another threat to his artistic concentration: symptoms ranging from difficulty concentrating and focusing, to hot flashes and numbness in his hands and feet plagued him. “On day I woke up and my arm was numb. It felt like somebody injected it with Novocain,” he says. Symptoms like these left Hale, and the doctors, puzzled. Last September, after two MRIs, Hale was diagnosed with Multiple Schlerosis. “Once I found out, I was glad I finally knew what was wrong with me…I believe that my art has improved. There’s a certain degree of maturity (that I’ve developed) and I place more emphasis on the development of ( my art). I go through periods where I can’t think very well, so I take advantage of the good parts,” he says. It was during these bouts with illness that Hale realized that art is an integral part of himself. There’s another side to Hale’s work, one that’s dear to many Elvis and Marilyn fans. Now Hale is exhibiting his works as an independent artist, but also as a member of “The New Eclectic.” This is a handful of professional abstract and figurative painters and sculptors from Bucks County. Art is to Michael Hale what a morning cup of java is to many people: without it the day just isn’t complete. Hale, 43, paints abstract art in which he combines the canvas with foil and rolls large drums on a flat, hard surface to create the illusion of metal on the canvas. He paints in layers, building and sanding down the layers as he goes along. 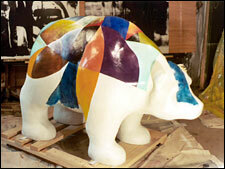 Hale is originally from Pittsburgh but moved to the Philadelphia area about 20 years ago. He now lives in Gilbertsville. His childhood inspiration came from his aunt and great-grandmother—both artists—and his early art education. 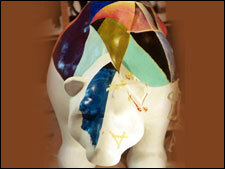 Hale uses a combination of acrylics and foils in an abstract technique he developed. “I combined the canvas with foil, which led to a foil-on-wood panel that actually appears as sheet metal. In “Drifters” I used a roller technique. I developed huge drums, like rollers, and I rolled them across the canvas. I paint flat on a hard surface and rarely use an easel. After I paint flat on canvas, I re-stretch it. In “Drifters” people will see movement, an undercurrent with the roller technique. The roller picks up a splatter of image and repeats it as the drum rolls across the surface giving a sense of movement and rhythm. With the dimension of the roller or drum I can change the timing of it. A smaller drum repeats the pattern more often. A larger drum makes it more spaced and slows the pattern down. For Hale, art is both a creation of something original, and an illusion.